A wide-ranging inquiry into the strained family law system will be launched — the first since the Federal Government passed legislation establishing a national Family Court in 1976. The review has already been greeted with cautious optimism from those on the front line of helping Australia’s victims of family violence, but Federal Labor is warning there is a need for urgent action. 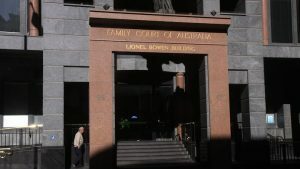 The family law system has been criticised for being painstakingly slow and prohibitively expensive, putting undue pressure on those hoping the Family Court and its other services can resolve some of the most emotional legal disputes. There has also been concern the rights of victims and children are being overlooked by a system strained by demand. Federal Attorney-General George Brandis described the review, to be run by the Australian Law Reform Commission (ALRC), as “necessary and long overdue”. Some of the changes being demanded by victims’ rights advocates include stopping alleged perpetrators of family violence being able to question their victims in court proceedings, and more funding for support services. “We are heartened to see the terms of reference reflect serious issues we see in our work at the family courts — including safety concerns, family violence and protection of vulnerable witnesses,” Women’s Legal Services Victoria acting chief executive Helen Matthews told ABC News. The Law Council of Australia welcomed the review, but warned inadequate funding was always a major problem. “Those on the front line of our family law system have been sounding the alarms for years,” president Fiona McLeod said. The review will be run by Melbourne Law School Professor Helen Rhoades, and is due to report back by the end of March 2019. Shadow attorney-general Mark Dreyfus argued there were many things that could be done to immediately improve the system — including filling vacancies on the Family Court bench — that should not wait until that deadline. But Mr Dreyfus was hopeful the ALRC would make some wide-ranging recommendations. “There are some longstanding issues about how the court goes about dealing with, for example, custody matters, and I’m looking forward to this systemic inquiry,” he said. In the 2017 Budget, the Government earmarked around $80 million for the family law system. Key crossbench senator Pauline Hanson has spent her time back in the political spotlight calling for changes to the family system, including abolishing the Family Court altogether. Senator Hanson first raised her concerns during her original foray in federal politics back in 1996.